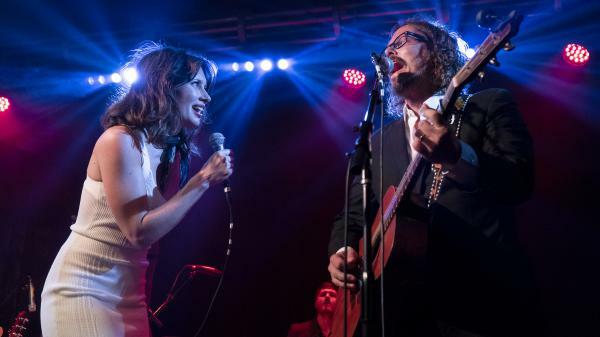 Lera Lynn (left) with John Paul White (right) performing at Lynn's record release concert in Nashville. Today, we're featuring a mini-concert from an artist you might first know as an actor. Lera Lynn's turn on the second season of True Detective introduced her to a lot of America, including myself. But those in the know have recognized her voice, style and songwriting ability, shown on albums like Resistor or The Avenues. On her latest album Plays Well With Others the Nashville singer-songwriter decided to broaden her songwriting and for the first time collaborated on a collection of duets. Nicole Atkins, John Paul White, Rodney Crowell and Dylan LeBlanc are some of those singing and songwriting partners on the album. Not a bad group of people to recruit for an album! To celebrate the release of the album, Lynn gathered many of her collaborators for a special record release concert at Nashville's 3rd and Lindsley. So off to Nashville we go, starting with Andrew Combs joining Lera Lynn to perform "Breakdown." Hear it all in the player.